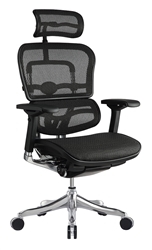 Eurotech chairs offer the high end ergonomic features needed to effectively fight back pain in the workplace. With an unmatched commitment to comfort and quality, Eurotech is ready to take your sitting experience to the next level in 2016. In today's post we'll highlight Eurotech's top rated seating solutions and their individual benefits. Enjoy! Not all ergonomic office chairs are created equal! 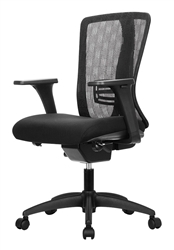 The Eurotech Seating Ergo Elite office chair is in a league of it's own. 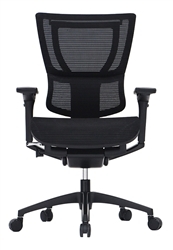 The model ME22ERGLT chair boasts a high back design and breathable mesh seating surfaces. 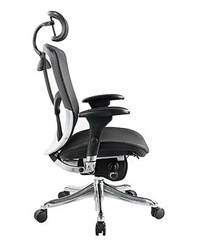 With a multi functional tilt mechanism, headrest, adjustable arms, and natural lumbar support, this top of the line ergonomic chair means business. Don't settle for a subpar office chair just because the funds are tight! Turn to a super user friendly chair like the Lume from Eurotech Seating. This adjustable mesh task chair is available for just $279.00 in 2016. The Lume is ready to help you effectively fight back pain with it's supportive mesh back design and smooth tilting functions. With a naturally supportive curve and wide base, finding the comfort and stability you need to operate at peak performance levels is easier the ever. Leave no doubt, the Lume is the full package! If chairs were living, breathing animals, subject to the same ruthless laws of natural selection other creatures are, the iOO would represent a pinnacle of evolution. A sleek, powerful product generations int he making, the iOO offers unmatched refinement and craftsmanship that's sure to be appreciated by any user. The iOO chair from Eurotech adapts, overcomes and excels in any setting. It's sophisticated mechanism is incredibly simple to operate and minimizes the need for lever pulling and tension knob adjusting. The segmented back design provides you with the support you need, where you need it most! 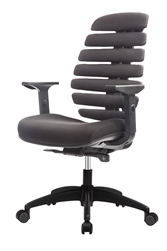 The iOO chair collection is sure to be a favorite of industry professionals and ergonomists in 2016. The FLX501 Eurotech Seating FX2 chair provides a distinctive modern look that's sure to impress in both home and business settings. The innovative, multi-tiered seat back flexes with the user for a more contour fit, providing comfort and correct support in whichever direction you go. The FX2 is also quite budget friendly at just $280.00. Shoppers not feeling the open back design, also have an option of a full back model with headrest in a choice of black and gray fabric upholstery options. Last but certainly not least, no article of Eurotech's pain battling office chairs would be complete without highlighting at least one model from the Fuzion Luxury collection. Chairs like the FUZ9LX boast a high back design that's complimented by polished frame and base features for a totally cool modern look. The upscale design is further enhanced with plethora of standard ergonomic features designed to have your back relaxed during those tough days in the office. Designed and made with the total comfort of humankind in mind, the FUZ9LX model Fuzion Luxury chair represents Eurotech's commitment to quality comfort. Esthetics, form and function allow this top of the line chair to utilize a synchro tilt mechanism with infinite tilt lock, sliding seat, pneumatic seat height adjustment, and headrest.